Cathy was a member of a selected Group exhibition at the New Gallery at The Sill about artists inspiration from the landscape of the Northumberland National Park and its environs. Cathy was delighted to be selected for Printfest in May 2018 at Ulveston in the Lake District. 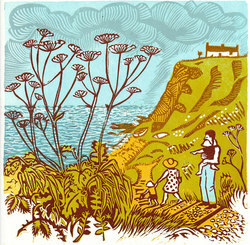 She had a very busy time and really enjoyed the atmosphere and meeting other talent d printmakers from around Britain. 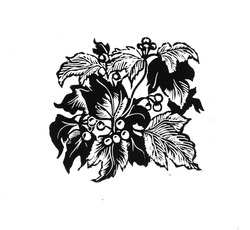 Group exhibition of Printmakers, Calligraphers and Bookbinders. Cathy shows her most recent linocuts. Please note: Baliffgate Museum is closed every monday but open on saturday and sundays. The Museum is closed for Christmas from 14th December to the 13th January 2015. Exhibition in Cathedral Crypt of Cathy's linocuts . Other artists exhibited throughout the Cathedral. There was the auction of her print "The Sparrows" as part of a fund raising event with other artists, in aid of the Cathedral. Exhibition of last year's sketches in The Circle Gallery, The Theatre by the Lake , Keswick and sketches of the 2014 Jazz Festival on show to the public. Exhibition of Linocuts based on sketches from Cathy's residency with Kim Lewis at Lancaster Castle, demi-paradise theatre production. 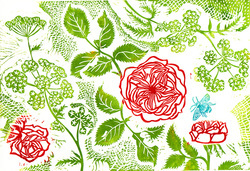 Cathy was included in a group exhibition of work by selected printmakers, held in the Gallery of Farfield Mill . This is a thriving Art's Centre and Museum in a converted Woollen Mill near Sedbergh, in picturesque Garsdale. Cathy was delighted to be selected for this prestigious event. 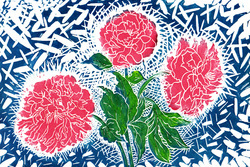 Printfest is the only Art Fair specifically for Printmakers . She had a successful time there, making many new friends from other exhibitors and speaking to interested members of the public. A Solo exhibition of Cathy's linocuts of musicans in Gallery at The Theatre by the Lake. The exhibition then changed for the Keswick Jazz Festival weekend May 10th -13th when the exhibition expanded to include Cathy's on-the-spot drawings of performers playing at the Festival. 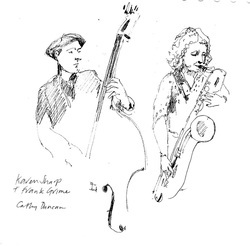 Cathy will be exhibiting and sketching the next Keswick Jazz Festival in May 2014. Spring 2013 Cathy was part of a group exhibition in this beautiful Arts and Craft House which is a Church of England retreat. More of Cathy's work can still be seen at the Gallery throughout the year. Saturday 25th and Sunday 26th August 2012, 10.30am to 4.00pm. Hexham Abbey Festival . See My Residencies page for pictures. 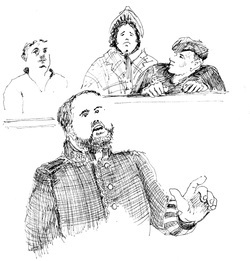 Original drawings of all the performers in this year's Abbey festival. 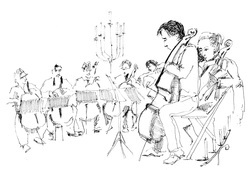 Drawn as Cathy watched and listened to their musical performance. Autumn 2012 Much Ado about Nothing, a demi-paradise production. great acclaim. 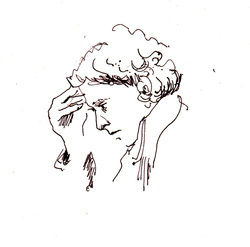 Cathy's drawings were exhibited during The British Shakespeare Association conference held in Lancaster University . An exhibition of the work was to be shown at The Dukes Theatre, Lancaster from 16th October to 26th October 2012.